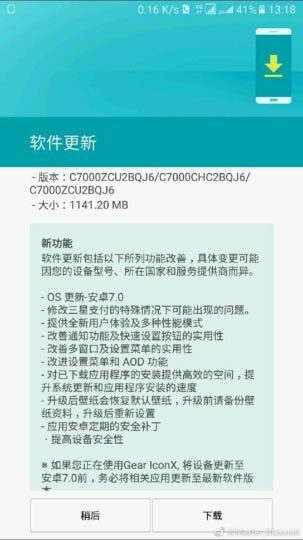 Samsung has started pushing out the Android Nougat v7.0 update to its Galaxy C7 Pro device. As of now, the update is hitting the devices in China – with other regions to follow soon. We don’t know whether the device will get the Android Oreo update or not, but considering the stiff competition company is getting company might roll out the Oreo update as well. The update weighs in at 1141MB in size and carries build number C7000ZCU2BQJ6. The update doesn’t bring Samsung Experience UX. As usual, it’s an OTA update can take from a day to a week to reach every unit. Those who are impatient can manually check for the update by heading over to the Setting’s menu of their perspective devices. Reminder: Before downloading the update make sure your device is charged up to 80 percent and is connected to decent internet connection as the update is large in size. How many of you have already received this new operating system update? Do share your experience via comments below!